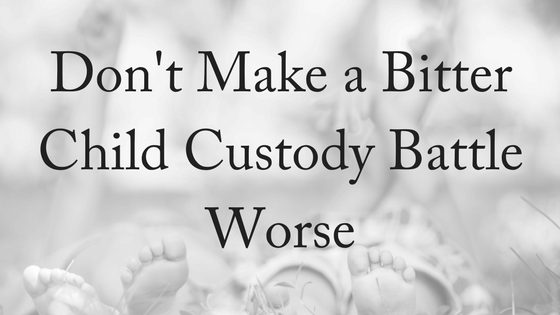 After a separation, it’s important that you focus on not making a bitter child custody battle worse. Child custody is a difficult part of separation and divorce, and sometimes, when there is a bitter child custody battle, involves the use of the courts to intervene. Once the court intervenes, parenting arrangements (or child custody orders) will be organised. Child custody orders are decided on what the court believes will be in the best interests of the child. Unfortunately, matters can be taken into parents’ own hands. Mick Clarke, a father of a seven year old boy, received the worst possible news in early June this year. His young child and ex-partner had both been found dead in the ex-partner’s home. Investigations have shown that she killed the young boy, then took her own life. A devastated Mr Clarke said he’d been fighting for custody for years.”She was an unstable person, but I could never have imagined her killing him,” he said. Mick Clarke’s story is an extreme example of what can occur in a bitter child custody battle, yet unfortunately, this can be a reality for some families. Some parents have decided to use technology in an effort to win their bitter child custody battle. Parents use technology to film or record conversations. In some battles, parents have recorded their children in an effort to catch them saying something negative about the other parent that may help them in court. Some recordings are taken with a phone while the parents ask questions while others are taken with hidden microphones or cameras. Increased access to digital recording devices has led to parents attempting to create their own evidence, with one major law firm in the United Kingdom saying that many of their clients were coming to meetings already equipped with recordings. Unfortunately, this can actually be harmful to both the child and the case. The parents may be trying to prove the child’s actual wishes (i.e don’t like the other parent or want to spend more time with one parent), however, this may actually affect the child’s welfare or can even backfire in court. Last year a father lost custody of his daughter after sewing bugs into her school blazer in an attempt to listen in to her meetings with her social worker. He awarded custody to the child’s mother, who had described the father’s actions as “unbelievable” and “really disturbing”. In many ca ses, recording a child, with permission or not, is unacceptable. If the court believes that the child is at harm from a parent’s behaviour, a third party will gather the necessary information from the child. The parents will not be present and this will only be used strictly for court evidence in assisting the court to make a decision. Parents filming themselves interrogating their child about the other’s parenting style is never a good thing, and often descends into putting words into their mouth. It harms the child’s welfare and gives the court nothing of value. In Australia, the Family Law Act presumes that both parents are responsible for the ongoing care of their children. This quite often means that parents share the care equally, rather than awarding one parent the majority of custody. This method broadly reduces the risk of a bitter child custody battle. Unfortunately, it is clear that a bitter child custody battle is damaging to all parties concerned – including the children. When divorcing or in a circumstance where parenting arrangements are needed, it is best to talk to seek specialist legal advice. They will be able to assist you on the best way to fight your battle and ensure your child is kept safe at all times. However, if you feel like your child is at risk of harm with the other parent, make a detailed report to authorities. At Divorce Lawyers Brisbane, we offer expert advice. Phillipa Kingswell is an experienced solicitor and accredited as a family law specialist by the Queensland Law Society. She brings sixteen years experience in the law with her, and has been practicing in family law exclusively for ten years. In 2011, Phillipa earned the title of Accredited Specialist in Family Law (Qld). Complementing her recognised technical skill and knowledge of the law affecting domestic relationships is her background in early childhood education and development. She brings her experience negotiating and documenting complex property transactions in the distribution of property between separating spouses to every settlement. For your free, 10-minute phone consultation, contact us today.